On this auspicious day, as I celebrate your appearance in this world, I stop for a few moments and reflect on your mercy upon me. I shudder to think where I would be now, as I enter the last phase of my life, had you not rescued me from the terrible ocean of material existence. The men and women of my generation toiled for years to enjoy the temporary pleasures of this world and are now retiring, hoping to live a life of quietude and contemplation. But the unfulfilled desires in their hearts will haunt them till the day they die. And thus the Lord accepted this fallen soul. 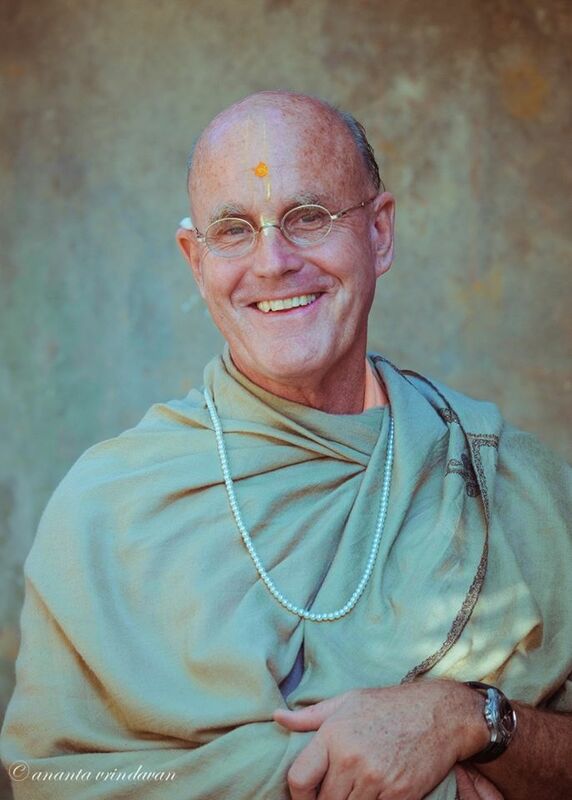 Defying all logic and reason, He engaged me, along with many others, in His modern-day pastimes of distributing the yuga-dharma, the chanting of the holy names, to every town and village in the world. Though I am lowborn, deceitful, and without any good qualities, I have never forgotten your kindness upon me. Not a single day passes, my beloved master, when I do not reflect on your causeless mercy. Thus, I re-commit myself to your service again and again. Srila Prabhupada, I know how seriously you take your — spiritual master’s order to spread Krsna consciousness. Though you are an intimate and beloved servant of the Lord in His eternal pastimes in the spiritual sky, and though you swim in the nectarean sea of devotion, you gave your full attention to the deliverance of the fallen souls of Kali-yuga. O Srila Prabhupada! May you never have to lament like that again. By your strong desire and your organizational expertise, your ISKCON movement continues to expand. I am very happy to hear that you are going to Poland. Bharadraja also speaks Polish. He may go there sometimes if it can be arranged. The preaching in Poland is the first consideration. Vrindavan is being managed somehow by others ... If you can preach vigorously in Poland it will be a great asset. You may come to Vrindavan if you like, but preaching in Poland is my greater interest. My dear spiritual master, please be relieved of all anxiety. Let me tell you the happy news that our festival program is enjoying its twentieth year along the Baltic Sea coast. Each summer more that 750 thousand people come in contact with Krsna consciousness in this massive event. Hundreds of people buy your books, thousands hear and even chant the mahamantra, and everyone enjoys the lectures, bhajans, and shows from our stage. And for your pleasure, this year at the Woodstock Festival in Kostrzyn we distributed 130 thousand plates of prasada. Each summer all these people go away with a good impression of this movement, which you struggled so hard to begin. Srila Prabhupada, it is your causeless mercy that you engaged us, hapless as we were, in this sacred task of helping you and the previous acaryas light the fire of sankirtana all over the world. On my first day of sankirtana, back in February 1970, I turned to a dear friend. “I could do this my entire life,” I told him. Now, my final days loom on the horizon, no longer a distant vision. Please let me tell you that if it is your desire, I will happily engage in this preaching work for the whole of eternity and beyond. Srila Prabhupada, I love this service you have given me, to “preach boldly and have faith in the holy names.” I worship this instruction with all my heart and soul. It is the be all and end all of my existence. I derive unlimited satisfaction and joy sharing my good fortune with others through sankirtana. I can honestly say that nothing in the three worlds appears as attractive to me. I do not claim to be free from material desires, nor am I saying I am a pure devotee. But let no one mistake it: Service to your lotus feet is infinitely more satisfying than all the pleasures this world has to offer. My dear spiritual master, I know that one day the curtain will close and my part in this festival program will come to an end. My hope and prayer is that my disciples will continue to push it on, having imbibed the purpose and spirit of this service from their own spiritual master. But please know that though this mortal body may perish, my desire to serve you will never falter. Please always include me in your preaching entourage wherever you go within the three worlds. Let death be at most a brief respite from the intensity of a lifetime spent serving you. And may my next birth be a continuation of such service, but with even more enthusiasm, determination, and success. I pray that after many such births my heart will be free from all the things that keep me from becoming your confidential servant. Perhaps then you will call me to your side to join you and your associates in the spiritual sky, where every step is a dance, every word is a song, and every day is a festival. I look forward to that moment, Srila Prabhupada.